Rubenerd: Agitating Google Reader users! 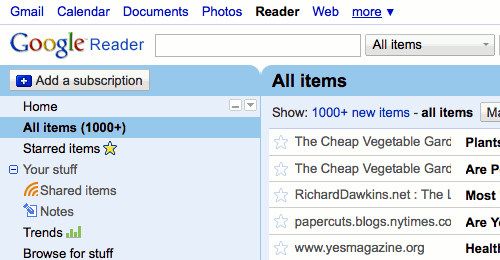 It seems that my latest post about Google Reader irked more than a few people. It wasn't that they didn't agree that the new interface was a downgrade; more that it irritated them and caused them much mental pain to see my Google Reader page with over 1000+ unread items shown. I'm here to apologise for such metal anguish and to assure you all I'll never let you see anything like that again. It is an interesting experiment though to see how people who use the same application can use it so differently. I tend to use Google Reader a lot on my iPhone so I'm used to skimming headings and only reading what's interesting. I also pay little to no attention whatsoever to the "Unread" post count. I figure I don't read every article in a newspaper or magazine, so why should I be expected to read every blog post? Bah humbug! Perhaps I'm just a shallow person, but I figure if the heading is boring and uninspired then it's a pretty good indication that the article will be too. Or if the heading is boring I check to see who it was written by; often I'll forgive people I'm interested in for not being creative with their headings. Though I've just thought of a way I can exploit this… stay tuned!